This article will address the epidemiology of reflex syncope in children and adolescents, its clinical characteristics and syndromes, the approach to diagnosis, and finally treatment. Frequency of the complaint of fainting as a reason for visiting a general practitioner in the Netherlands. Data are obtained from the general practitioners transition project. It concerns an analysis of 93 297 patient years. The arrow around 1 year is to indicate that a small peak occurs between 6–18 months (breath-holding spells). Between 2–5 years syncope is rare. Revised after Wieling W, et al. Ned Tijdschr Geneesk 2003;147:849–54 with permission of the editor. The incidence of syncope in young subjects coming to medical attention varies from approximately 0.5 to 3 cases per 1000 (0.05–0.3%).2 Syncopal events which do not reach medical attention occur much more frequently. 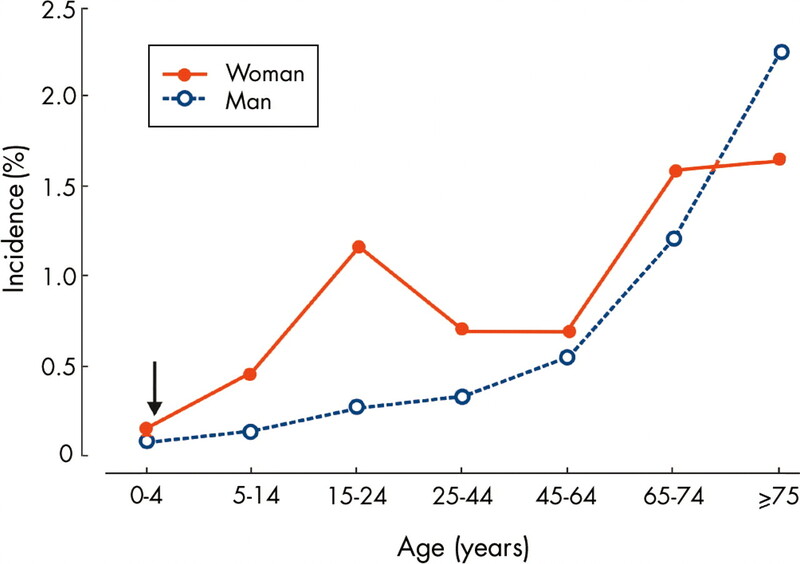 In fact, the recently published results of a survey of students averaging 20 years of age demonstrated that about 20% of males and 50% of females report to have experienced at least one syncopal episode.4 By comparison, the prevalence of seizures in a similar age group is about 5 per 1000 (0.5%)5 and cardiac syncope (that is, cardiac arrhythmias or structural heart disease) is even far less common. By far the most common cause of syncope in young subjects is a reflex syncopal event and in particular a vasovagal faint1–4 This disorder is the focus of the present review. The term “reflex syncope” is used to label a heterogeneous group of functional disturbances characterised by episodic vasodilation and/or bradycardia resulting in transient failure of blood pressure control.6 The circumstances surrounding reflex syncopal events often include a recent change in posture, but may be associated with a wide variety of common situations (table 1). Not only reflex mediated effects, but also physical factors inducing systemic hypotension like straining are involved. Often a combination of reflex and physical factors is present.1,4 Following are descriptions of the more common forms of reflex syncope seen in young subjects. The clinical presentation of vasovagal syncope may vary widely both within and among young patients. The trigger may be emotional for one event, and postural for another. Further, vasovagal episodes may occur without an identifiable trigger, even in patients who are sitting. Apparently benign vasovagal episodes may also occur during normal daily exercises such as playing, walking or cycling, and even during strenuous exercise. However, events that occur while supine in the absence of an emotional stimulus are unlikely to be vasovagal. Syncope or particularly presyncope upon standing is observed much more commonly in the young than in adults. Almost all teenagers and adolescents are familiar with a brief feeling of lightheadedness within a few seconds of standing up quickly, which typically resolves spontaneously within 30 seconds.8,9 Such complaints are most common after prolonged supine rest or after arising from the squatted position. In some instances true syncope may occur upon standing in otherwise healthy teenagers and adolescents. The complaints are caused by a transient fall in arterial pressure which occurs upon active standing, but not so dramatically or not at all upon a passive head-up tilt. The initial transient fall in pressure in normal young subjects is caused by vasodilatation in active muscles during standing up.8 Patients with the most severe complaints tend to be tall with an asthenic habitus and poorly developed musculature. The mechanism underlying the excessive fall in pressure in these patients remains to be established (fig 2). Changes in heart rate (HR) and blood pressure (FINAP, finger arterial pressure) in a patient and a 10 year long history of almost daily near syncope and occasional syncope upon standing up. Note the pronounced initial fall in finger blood pressure with lightheadedness on standing, but not with passive head-up tilt. Revised from van Dijk N, et al. Ned Tijdschr Geneesk 2000;144:249–254 with permission of the editor. Postural orthostatic tachycardia syndrome (POTS) has received much attention lately. It is defined by symptoms of cerebral and retinal hypoperfusion (that is, lightheadedness, fatigue, weakness, blurred vision) and an excessive increase in heart rate in the upright posture with arterial blood pressure values in the low normal range.10 Reduced cerebral blood perfusion has been documented using transcranial Doppler techniques. A variety of physiological aetiologies may be responsible for the observed changes, including excessive venous pooling, enhanced cardiac sympathetic receptor responsiveness, reduced peripheral sympathetic receptor responsiveness, enhanced reflex sympathetic activation, and inappropriate cerebral vasoconstriction to sympathetic stimuli. Disturbed cerebrovascular autoregulation is almost uniformly present since cerebral blood flow is reduced while blood pressure remains in the normal range. Other symptoms of sympathetic activation such as diaphoresis and tremulousness may be present. After early childhood, resting heart rate and the degree of postural tachycardia are inversely related to age.8 In fact, heart rate increases with standing of more than 20 beats per minute are not uncommon in normal teenagers, probably related to lower extremity and splanchnic blood pooling in their more compliant venous vasculature. Thus, the normal ranges need to be adjusted for age. In the average adolescent, an increase in heart rate of > 35 beats/min or to > 120 beats/min after two minutes standing can be considered excessive.8 POTS is more common in females, with a ratio of about 4:1. Actual loss of consciousness occurs in a minority of the subjects. In part because there is no single specific diagnostic test, an accurate diagnosis of POTS probably requires evaluation at a centre specialising in the management of patients with autonomic disorders. The prevalence of POTS in the general population is not known, but is probably low. Hyperventilation decreases carbon dioxide, causing cerebral vasoconstriction. Thus, hyperventilation is one of the non-reflex mediated causes of presyncope in young subjects. Straining which impedes venous return may also decrease cerebral blood flow. These adjunctive influences, in combination with orthostatic stress, have been applied by young subjects for self induced fainting as entertainment or for avoiding an undesirable task, such as a school examination (fainting lark). The faint is initiated by the subject first hyperventilating while squatting, then standing up quickly and performing a forced expiration against a closed glottis. These manoeuvres combine the cerebral vasoconstriction induced by hyperventilation, with acute hypotension induced by standing quickly, with reduced venous return and cardiac output induced by straining.12 Almost instantaneous syncope occurs. The same combination of factors is probably involved in epidemic syncope in female teenage fans during rock concerts. The fainting lark has also been used as a research tool to study the sequence of events during syncope in young adults. Syncope may also occur in as many as 5% of toddlers.2,3,6 Although many of these events occur in the absence of any specific respiratory scenario, they most commonly occur at the time of crying during or after a mildly traumatic event or tantrum. Because the cry is often “silent”, the name “breath-holding” has been applied and stuck. The spells have been described to come in two varieties—pallid typically after a short cry, and cyanotic after a more prolonged one. Though difficult to document, the pallid form seems to be the result of sudden transient asystole. The most likely mechanism for the cyanotic ones may be quite similar to the fainting lark, where the hyperventilation of crying is combined with the Valsalva effects of a prolonged silent cry, leading to reduced venous return, hypotension, and loss of consciousness. The onset is typically between 6 months and 2 years of age, and fortunately they generally self resolve by 3–4 years of age. Though frightening, the spells have not been associated with serious outcomes, such as sudden infant death. A conversion reaction is a rare cause of apparent transient loss of consciousness in young subjects. However, it may occur in adolescents, more commonly in females. The diagnosis should be considered when the number of syncopal events is high (up to several times a day), and there is no associated physical injury. The duration of the loss of consciousness is often prolonged (10–30 minutes) despite a supine posture, a finding which is inconsistent with hypotension/hypoperfusion induced syncope. During an episode, the eyes may be tightly closed with a lid flutter, while during true syncope or epilepsy the eyes are often open and deviated. An unusual posture may be assumed. Passive lifting and dropping of an extremity rarely demonstrates limpness or lack of regard for pain.14 Most importantly, when blood pressure is being monitored, it is always normal or elevated. If cerebral blood flow is monitored and is also normal, physiological syncope is ruled out. Typically, patients are using the events to consciously or unconsciously avoid an unpleasant emotional situation. Simulated convulsions (pseudo-seizures) have also been reported in young subjects as a cause of transient loss of consciousness. Finally, illicit substance abuse, in particular alcohol and cocaine, can be associated with unexplained episodes of syncope. When related to the basilar artery, migraines can be a cause of syncope.14 Although specific cerebral flow deficits have not been documented, prodromal symptoms generally suggest brainstem or cerebellar ischemia, yielding the name “basilar migraine”. Attacks may start with bilateral visual symptoms, dysarthria, vertigo, diplopia, nystagmus and/or ataxia, progress to syncope, and be followed by a more typical migraine headache. However, the headache may not always be present. Arterial pressure is typically normal or mildly elevated, but not reduced, supporting local restriction of brain blood flow as the mechanism. A family history of migraines is common in patients with syncope, as well as those with basilar migraine. Importantly, reflex syncopal disorders have an excellent prognosis, but may have serious social repercussions and a dramatic impact on quality of life.15 Diagnosing these disorders, therefore, is of great importance. A detailed patient and family history is the most crucial part of the initial work up. In most young patients without known heart disease, a typical history as specified in tables 1–3, in the presence of a normal physical examination and ECG, can be used to make a presumptive diagnosis of benign reflex syncope. Details of the history are directed at both determining whether the transient loss of consciousness might be caused by a non-syncopal condition, such as seizure or drug intoxication, and importantly, whether the syncope could have had a potentially malignant aetiology, such as a tachy- or bradyarrhythmia (table 3). Although the vast majority of young patients with syncope will end up classified as benign reflex syncope, it cannot be overemphasised how critical the history is in making that determination. Many young subjects with reflex syncope have a history of syncope in an immediate family member, which has not been associated with sudden death. The physical examination should focus on the heart and measurement of blood pressure. Heart rate and blood pressure should be assessed with the patient supine and after two minutes standing. A 12 lead surface ECG is recommended to screen for the more unusual case of cardiac syncope—for example, long QT syndrome, arrhythmogenic right ventricular dysplasia, Brugada syndrome, Wolff-Parkinson-White syndrome, heart block, or hypertrophic cardiomyopathy. The history and physical examination should be used to guide the subsequent diagnostic work-up. Ambulatory ECG recorders should be used in patients with a history of palpitations associated with syncope. Whether to choose a 24 hour, 48 hour, or longer term event recorder depends on the anticipated frequency of attacks as suggested in the history. Documenting events shorter than a few minutes, and less frequent than daily, will almost certainly require continuous monitoring with a memory looping monitor. 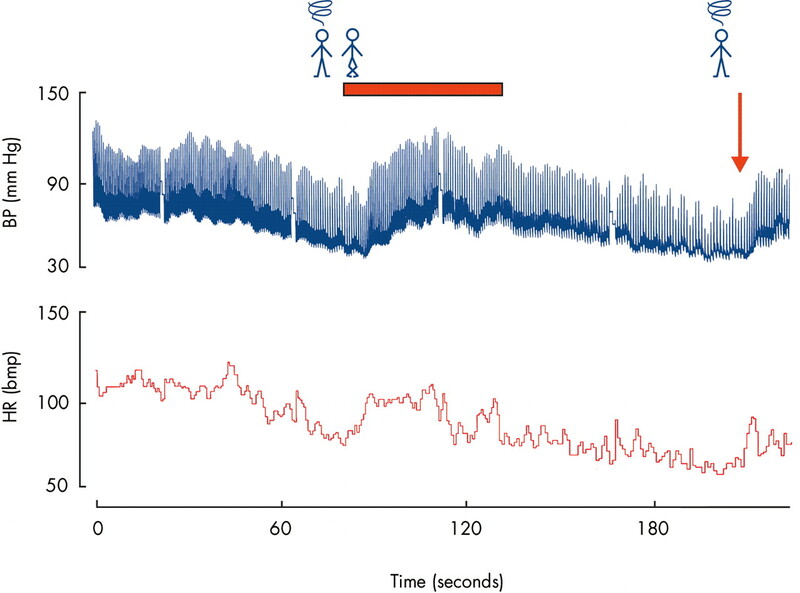 Longer, less frequent events can sometimes be captured with a non-memory looping monitor; however, the likelihood of the device being nearby during an event may be low in an active child or adolescent. 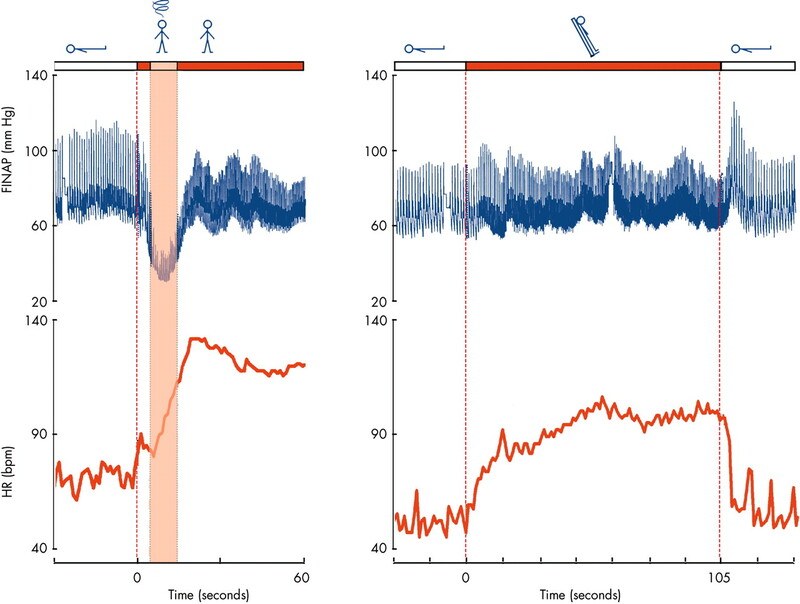 The implantable loop recorder may be particularly effective in cases of troublesome but infrequent syncope, but the requirement for implantation and the high cost both serve as barriers in young subjects. Cardiology consultation including echocardiography should be obtained when a heart murmur is present. Whenever syncope occurs during physical exertion or exercise, an echocardiogram and an exercise test should be performed in addition to the history, physical examination, and ECG. Syncope occurring in the cool down phase just after exercise is likely to be neurally mediated, but should also be treated with a higher level of suspicion than syncope associated with the more typical scenarios described above. Electroencephalography may be indicated for patients showing prolonged loss of consciousness, seizure activity, or a significant post-ictal phase of lethargy and confusion. Electrophysiological study has a very minor role in paediatric patients with syncope, especially in the absence of structural heart disease. However, testing may be warranted if there is high suspicion of a tachyarrhythmia, particularly in the case of previously operated congenital heart disease, or if a significant ECG abnormality is identified. In patients with “atypical” vasovagal syncope, or in patients with unexplained syncope and a normal cardiac evaluation, tilt table testing can be helpful. Such testing may not be warranted after a single event, but is appropriate for recurrent syncope, particularly for cases where the non-pharmacologic treatments described below have been ineffective. The primary caveats for head-up tilt testing are high false positive (10–20%) and negative rates (up to 50%) in adults. The false positive rate may be even higher in children and adolescents, approaching 40% after instrumentation with an intravenous line.16 However, false negatives may occur less frequently than in adults. Given these observations, the tilt test is not the most appropriate tool for the primary identification of patients with vasovagal syncope. However, a positive response to tilt testing in a patient with recurrent syncope may be reassuring to the physician and family, as well as useful teaching therapy to the patient (see below). Tilt table testing can also be helpful in patients with conversion reactions. In such cases loss of consciousness may occur with no significant decreases in heart rate, blood pressure, or cerebral blood flow, and no changes in EEG. Further, typical signs of vasovagal syncope are absent. Myoclonic jerks mimicking a seizure may occur during vasovagal syncope and in other forms of syncope as well.17 Typically, a prolonged asystole of about 10 seconds is needed in adults before myoclonic jerks occur. In young persons the anoxic threshold is reported to be lower than in adults, and is lowest in early childhood. Clinical features known to be helpful for distinguishing myoclonic jerks from the abnormal motor activity associated with “grand mal” seizures are summarised in table 3. The cause of the syncopal event determines the appropriate treatment. Management of syncope caused by a cardiac arrhythmia or seizure is addressed elsewhere. This discussion will address vasovagal syncope. For acute management of a vasovagal faint, whether or not it is situational, recognition of early presyncopal symptoms followed by appropriate physical manoeuvres to counteract the effects of gravity on the circulation is usually sufficient to avoid loss of consciousness. The simplest counter-manoeuvre, and by far the most effective, is assumption of a supine posture. Elevation of the legs may also be performed to further increase venous return to the heart. Sitting and lowering the head between the knees may also be used. However, over the last few years, a number of more subtle counter-manoeuvres have been described which have demonstrated effectiveness without drawing as much attention to the patient as lying down, an important point for many adolescents. These counter-manoeuvres all decrease pooling of venous blood in the lower extremities and abdomen, while some also increase peripheral arterial resistance. The net result is increased venous return to the heart, cardiac output, blood pressure, and cerebral perfusion, leading to elimination of the presyncope. The combination of leg crossing and tensing of the thigh and abdominal musculature is easily taught and highly effective in young patients with reflex syncope.18 Squatting is even more effective, in part by increasing peripheral resistance at arterial flexures, and can be used as an emergency measure when presyncopal symptoms develop more rapidly. The major advantage of physical counter-manoeuvres is that they can be applied immediately at the start of symptoms, often without drawing inordinate attention. Perhaps the most important treatment for patients and their families is education and reassurance. Patients should be informed that the risk of sudden death is virtually non-existent, but that physical injury is still of some concern. Initial advice should include early recognition of warning symptoms and avoidance of triggering events. A tilt table test can be employed for explanation and to teach the patient to recognise early premonitory symptoms in a safe setting. Interestingly, the frequency of syncopal events decreases substantially after tilt table testing alone, suggesting that the clinical encounter, education, and counselling are effective therapeutic interventions. However, there are a number of specific treatments available as well. When questioned, many syncope patients turn out to be salt and/or fluid avoiders. Further, a number of patients and/or their parents report very low urinary frequency and notation of concentrated urine. Each of these findings can be addressed. A low salt diet should be avoided. Hydration status can be improved with a regimen of “superhydration”, achieved by adequate liquid intake to produce colourless urine at a frequency of twice in the morning and twice in the afternoon. Beverages that contain electrolytes and/or sugar will be the most helpful. Fluid intake is particularly important on the hottest days, before and during sporting activities, or when symptoms are frequent. Furthermore, leg crossing (see above) can be used as a preventative measure under stressful conditions before pre-syncopal symptoms occur (fig 3). Aborting a vasovagal faint. Typical event in a 15 year old female with recurrent syncope. Episode induced during tilt. Note progressive fall in finger blood pressure (BP) and heart rate (HR) which recover rapidly after leg crossing and leg and abdominal muscle tensing (bar). Blood pressure and heart fall after uncrossing (arrow), and the subject is returned to supine. In highly motivated patients with recurrent symptoms, progressively prolonged periods of enforced upright posture or “tilt training” may reduce recurrences.19 The precise mechanism underlying its effectiveness is unknown, but is probably related to decreasing vascular compliance in the compartments most responsible for venous pooling. Patient compliance may limit its use in young subjects. Pharmacologic treatment should be reserved for the rare patient with continued symptoms despite the non-pharmacologic approaches described above. However, undesirable side effects often outweigh any positive effects. β Blockers are prescribed most commonly in adults, but in most trials are no more effective than placebo and frequently have side effects. The mineralocorticoid fludrocortisone is used most commonly in young subjects to increase blood volume. It may be most effective in combination with high salt and fluid intake. Mild fluid retention and occasional hypertension are generally the only significant side effects, making fludrocortisone the best tolerated agent in paediatric patients. Other medications include α agonists like midodrine or pseudoephedrine to increase the peripheral vascular resistance and venous tone, but the side effects of both medications are often intolerable. One unresolved issue is for how long prophylactic treatment with any compound should be advised, since reflex syncope is a self limited, non-life threatening condition in most young patients. Even in the event of cardioinhibitory syncope with a documented prolonged asystole, pacemaker treatment should be avoided whenever possible. Effective management with conventional treatment without the need for pacemaker implantation is almost always possible and clearly preferable in young patients. Pacing should be reserved for the rare patient with documented recurrent prolonged asystole during a clinical event. Most patients can be dealt with through reassurance and instructions to maintain the infant or toddler in a supine position, rather than holding them in the arms upright during a spell. When asystole or a prolonged heart rate pause is documented to occur during a spell, the muscarinic blocker glycopyrollate may be helpful in three small divided doses of 0.25–0.5 mg per day. Only the rarest cases require pacing, and only when associated with long asystoles or repeated injuries during syncopal events. Syncope is common in children, teenagers, and adolescents. It is usually attributable to neurally mediated reflex syncope, but the differential diagnosis includes potentially dangerous disorders such as cardiac dysrythmias or ventricular outflow tract obstruction, which are far less common in children than adults. The most important part of the diagnostic evaluation is taking a good history and performing a physical examination The patient’s symptoms before and after the syncopal episode and an observer’s description of the event will help to determine the cause in the vast majority of patients. An ECG should be used as a screening tool for the unusual cardiac causes. If there is doubt about the diagnosis, cardiac causes must be ruled out and eventually a tilt table test can be done. The mainstay of management of young patients with reflex syncope consists of advice and education on the various factors that influence systemic blood pressure in conjunction with chronic expansion of the intravascular volume. Wieling W , Ganzeboom KS, Krediet CTP, et al. Initiele diagnostische strategien bij wegrakingen: het belang van de anamnese (Initial diagnostic strategy in the case of transient losses of consciousness: the importance of the medical history). Ned Tijdschr Geneesk2003;147:849–54. Driscoll DJ, Jacobsen SJ, Porter CJ, et al. Syncope in children and adolescents. J Am Coll Cardiol1997;29:1039–45. Lombroso CT, Lerman P. Breathholding spells (cyanotic and pallid infantile syncope). Pediatrics1967;39:563–81. Ganzeboom KS, Colman N, Reitsma JB, et al. Prevalence and triggers for syncope in medical students. Am J Cardiol2003;91:1006–8. ▸ This recent study shows that the prevalence of reflex syncope is very high in young subjects and that it can be caused by a large variety of triggers. Wallace H , Shorvon S, Tallis R. Age-specific incidence and prevalence rates of treated epilepsy in an unselected population of 2052922 and age-specific fertility rates of women with epilepsy. Lancet1998;352:1970–3. Saul JP. Syncope: etiology, management, and when to refer. J South Carolina Med Assoc1999;95:385–7. ▸ A brief review of the important aspects of syncope and its management in a primary care setting. Stephenson JBP, McLeod KA. Reflex anoxic seizures. In: David TJ, ed. Recent advances in pediatrics 18. Edinburgh: Churchill Livingstone, 2000. ▸ This is an excellent update of fainting in young subjects. The senior author has a lifelong experience with this condition and has made key contributions. Wieling W , Karemaker JM. Recording of heart rate and blood pressure in the evaluation of neuro-cardiovascular control. In: Mathias CJ, Bannister R, eds. Autonomic failure. A textbook of clinical disorders of the autonomic nervous system. 4th ed. Oxford: Oxford University Press, 1999:196–210. ▸ This is a classical reference dealing with the evaluation of orthostatic cardiovascular responses. It stresses the importance of the differences between initial and delayed impairments in circulatory adjustments. Tanaka H , Yamaguchi H, Matushima R, et al. Instantaneous orthostatic hypotension in children and adolescents: a new entity of orthostatic intolerance. Pediatr Res1999;46:691–6. ▸ This article gives an excellent overview of a condition that has been overlooked by paediatricians and clinicians. Low PA, Sandroni P, Singer W, et al. Postural tachycardia syndrome – an update. Clin Autonom Res2002;12:107–9. Pelekanos JT, Dooley JM, Camfield PR, et al. Stretch syncope in adolescence. Neurology1990;40:705–7. Howard P , Leathart GL, Dornhorst AC, et al. The “mess trick” and the “fainting lark”. BMJ1951;ii:382–4. Axelrod F . Genetic autonomic disorders. Clin Auton Res2002;12 (suppl 1) :1–47. Van Dijk JG. Conditions which mimic syncope. In: Benditt DG, Blanc JJ, Brignole M, Sutton R, eds. The evaluation and treatment of syncope: a handbook for clinical practice. Blackwell/Futura 2003. Linzer M , Pontinen M, Gold DT, et al. Impairment of physical and psychosocial function in recurrent syncope. J Clin Epidemiol1991;44:1037–43. De Jong-de Vos van Steenwijk CCE, Wieling W, Johannes JM, et al. Incidence and hemodynamics of near-fainting in healthy 6-16 year old subjects. J Am Coll Cardiol1995;25:1615–21. Hoefnagels WAJ, Padberg GW, Overweg J, et al. Transient loss of consciousness: the value of the history for distinguishing seizure from syncope. J Neurol1991;238:39–43. ▸ This landmark article describes the great value of history taking in patients with transient loss of consciousness. Krediet CTP, Van Dijk N, Linzer M, et al. Management of vasovagal syncope: controlling or aborting faints by the combination of legcrossing and muscle tensing. Circulation2002;106:1684–9. ▸ This is the first article that documents the effectiveness of physical counterpressure manoeuvres to combat orthostatic hypotension in reflex syncope. This approach is now considered as part of the basic instruction of patients. Reybrouck T , Heidbuchel H, Van De Werf F, et al. Long-term follow-up results of tilt training therapy in patients with recurrent neurocardiogenic syncope. Pacing Clin Electrophysiol2002;25:1441–6. Dijk N , Velzeboer SCJM, Destree-Vonk A, et al. Psychological treatment of malignant vasovagal syncope due to bloodphobia. PACE2001;24:122–4. The references are available as a downloadable PDF (printer friendly file).